The Opium Of The People is the third edition of the novel to be printed. Along with corrections made to the two prior editions there was a change to the cover art, the cover is a piece from the artist Laura Givens entitled “Come to Jesus”. The Opium Of The People’s basic premise of the novel was intriguing. This is a story of how the world as we know it could very well change. What if the American government was overthrown, what would we or could we do? The author tells a story of the American people falling under the control of what he calls “a radical right-wing fundamentalist christian government”. This new government is ruled by the Grand Patriarchs who take away freedom and enforces a law that we would never have imagined possible. He tells of a world full of gloom, torture and one filled with danger for all. He also tells of how the best of people must resort to extreme measures in an effort to regain control of their futures before its too late. Or is it too late? You will have to pick up a copy and read this one for yourself, as mentioned at the beginning of the review this is the third printing of the title and was originally written and published before the current crisis we face now happened. 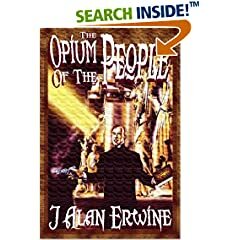 J Alan Erwine has a plot line that is creative, and he exhibits excellent writing skills and can effectively tell a story. The characters are multidimensional and realistic. Although the book still has a few errors and typos, it is very well written. J Alan Erwine currently resides in Colorado. He has published more than three dozen short stories and has published 2 short story collections.